Everything you wanted to know about Parenting, and maybe some stuff you didnt! Clearly you wont need a high chair straight away, but while your in this whirlwind buying frenzy you might as well get one now. Considering your baby will most likely use their high chair at least once a day everyday until they are about three years old it is a good idea to do a bit of research. · Fold Flat - First you need to think about how much space you have in your house. High chairs normally take up a lot more room than a standard chair, and you cant push them under a table either, or they would be a low chair and that would kind of defeat the whole object! There are lots of chairs on the market that fold flat, look for one of these if you don’t have an awful lot of space. · Tray or No Tray? – Many highchairs come with either an integral tray or a removable tray. I found that having a tray is a lot better as it puts the food in the right position for your child and makes it easier to reach. Also most trays have some kind of lip around the edge to help food bowls from being pushed off, and believe me this will happen a lot!. · Wipe Clean Surface – This is essential as your chair will get covered in food practically every time your child has a meal. · Height Adjustability – This can be useful if you will be positioning your child in different locations to eat and want them to be at the same level as everyone else, for example we sometimes let our daughter eat in the living room and we can lower her down to the same level as everyone else sitting in sofas and comfy chairs. · Ability to Recline – We found that this was a useful feature when our daughter was young and still having milk from a bottle, although now that she is older we do not use the feature at all. You will definitely need a few of these they are insulated covers that go over your bottles and keep them warm for quite some time. Fingers just wont do the job here, buy a brush and save yourself some effort. Make sure you get lots and lots and lots of bibs. Dad TIP: You will probably want to buy some nice cute bibs which is fine, but also buy a big pack of cheap plain no-nonsense bibs for everyday use as you will find that often a bib gets so messy that the only sensible thing to do with it is throw it in the bin. There are a few other things that you may want to buy, but it really does depend on your personal preference. We bought an electric bottle warmer which is a device that you put a single bottle onto, and after about 15 minutes your bottle is at the correct temperature, I used it once! We were also bought a travel bottle warmer as a gift, which is essentially a small flask, with a large cup over the top of it. The idea is that you fill the large cup with the hot water from the flask and place your baby bottle in the cup of hot water, we used this practically every time we were out with our daughter. You will need to sterilise all your bottles, teats, spoons etc. every time they are used, as your baby does not have a very good immune system, and this helps to stop your baby picking up any unwanted germs. 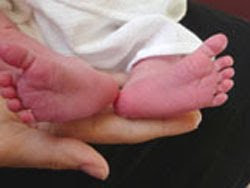 The general advice is to keep sterilising until your baby is a year old so you will be doing a lot of sterilising, so it’s a good idea to choose the right system for you. There are two ways of sterilising, the first is to use a sterilising solution, these usually come in the form of a tablet that you dissolve in water and you place your items in this water for about 15 minutes. The second way of sterilising is with steam, where your items are immersed in steam for about 5 minutes. To make things more complicated there are a few different ways of implementing the steam method. You can buy an electronic steamer, this is a bit like an electronic food steamer but for baby bottles. An electric element heats up a small amount of water and steams your bottles for a set amount of time, they usually have a timer that will beep after about five minutes, and automatically shut off the steam for you. Another system is the microwave system, which is a similar to the electric system, but instead of an electric element that heats up the steam you put the whole thing in the microwave which in turn heats up the water. The last method is a steamer bag which is a plastic bag that you fill with your bottle and some water, and again put in the microwave to generate the steam. o Takes a long time (about 15 minutes). o Can be carried out anywhere, i.e. where there is no microwave or electricity. o Can sterilise all your equipment in one go. o Need to keep stocking up with tablets. o Takes up space on your kitchen worktop. o Very quick (about 5 minutes). o You can store your bottles inside of the steriliser. o Can usually be bought as part of a system, i.e. along with bottles, spoons, brushes etc. o Very easy to use, can be turned on then left alone. o Not as easy to use as the other two, as you have to carry the whole thing in and out of the microwave. o Cheaper than an electric steamer. o Small and compact system, doesn’t take up any space in the kitchen. o You cannot do multiple bottles in one go. o Good for travelling (as long as there is a microwave where you are travelling too). Now I am not going to go into the discussion of whether you should be breastfeeding or not, this is a personal choice and all I would say is that whatever feels right usually is right. So if you are going to be bottle feeding here’s what you will need. Make sure you buy at least four bottles, as you will be constantly washing and filling them so the more spare bottles you have the better. As your baby wont be drinking too much milk in one go you can start off with the smaller bottles if you like, but you will eventually need to replace them with bigger bottles after about six months. You need to decide on what type of bottle/teat system you will be using, there are many different brands out there, but remember that the teats are graded in terms of the babies age. DAD TIP: Try to get teats that have an air-inlet valve these allow the air to enter the bottle as the milk comes out of the bottle, helping things flow nicely. ‘Buckle Crunch’. So firstly let's try and describe buckle crunch. Let's pretend you had a pencil and you wanted to break it. If you pulled it from one end and a second person pulled from the other the chances are the pencil would not break. Now if you placed the pencil in both your hands and "snapped it" the pencil would of course break immediately. In theory we have described "buckle crunch", except you need to replace in real life the pencil with the buckle located on the cars seat belt. In normal passenger usage the force in a accident is applied down a seat belts length but when placed around a car seat sometimes the seat belts buckle lies across the frame of the child cars seat. In event of an accident the seat is then thrown against the seat belt buckle and it can burst open as the force is going "across" as opposed to "down". 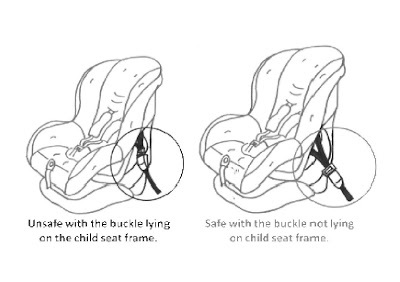 In practice however many car seat fitters definition of buckle crunch varies. Some people consider that even if the buckle touches the frame of the car seat that is enough to consider the child's car seat as being unsafe in the car. Other people are more tolerant and define buckle crunch when the buckle lies across (or nearly across) the car seats frame. 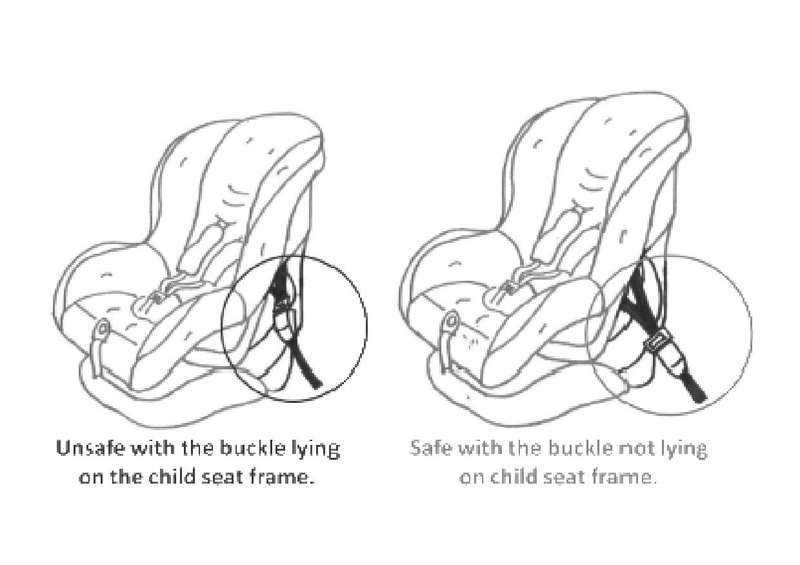 In short this is a matter of opinion but everyone would agree if the buckle is laying across (or nearly across) the car seats frame it is without question unsafe to be used in the car you are trying to get it to fit. DAD TIP: Try and go for a baby carrier that has a base that you fix permanently in the car. This means that everytime you take your baby in and out of the car (which will be a lot), all you need do is click the carrier into its base, rather than mess about with a seatbelt everytime. 5 point safety harness which fits snugly - baby and younger children’s car seats come with an integral, adjustable safety harness. It needs to fit very snugly over the shoulders to meet the buckle coming up between the legs. One-pull harness - the easier all straps on a car seat are to adjust, the more likely you are to fit it correctly. Many harnesses are now designed to adjust by quickly and easily pulling one single adjuster strap until the harness is a snug fit. Tamper-proof buckle - this is coloured red to make it easy to spot and is easy to release in an emergency by an adult, but designed to be difficult for young fingers to undo. Padding - all baby and child car seats should be well padded for both comfort and added protection. The shell should be sturdy (though it may be lightweight) and contoured. Weight - if you're going to be using it with different cars or carrying your baby in it, a lighter model may be best. Seat covers - many car seat covers are removable for machine washing. Choice of positions - forward facing seats (from 9kg up) may have the option to recline or lie flat, which is a bonus if you want your baby to sleep on longer trips. Installation - most seats need an adult lap and diagonal belt to secure them, although some forward facing seats can be secured with just the lap belt in the middle of the back seat. It is best to try the seat in your car before you purchase it, if it doesn’t fit correctly then don’t buy it. This is one of the most important things you will buy, the hospital wont let you take your baby home unless you have a proper car seat. Clearly some car seats are designed to span more than one group which means that you can use them for longer before upgrading to a bigger seat. Most people start off with what people tend to refer to as a ‘baby carrier’ this is a car seat that has a handle over the top of it that allows you to detach it from the car and use it to carry your baby around in. Now if you have opted for a travel system this will also attach to your pram frame. It is worth pointing out at this point that it is not recommended that you keep your newborn baby in a car seat for too long as it is much better for you baby to be lying flat for proper lung development. As soon as you are able to take your baby out of the car seat the better, even if they are sleeping it is better to transfer them into a Moses basket rather than let them sleep in the car seat. DAD TIP: Bear in mind that boys are generally a lot bigger and grow faster than girls. Our friends son outgrew his 0+ baby seat after about six months while our little girl didn’t outgrow hers until about 13 months. Copyright Chris Lyons. Watermark theme. Powered by Blogger.